Includes general probate information as well as Oklahoma statutes concerning probate, trusts, guardianships, powers of attorney and other related matters. Also contains pivotal information on taxation of decedents, estates and trusts. 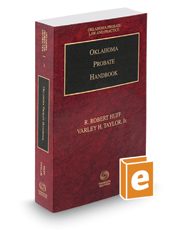 Provides a very useful statutory cross-reference table to Oklahoma Probate Law and Practice, 3d, where you will find an in-depth analysis of Oklahoma probate law and a host of forms.